Blunt injury to hollow organs is rare in adults, but a little more common in children. This is due to their smaller muscle mass and the lack of protection by their more flexible skeleton. Duodenal injury is very rare, and most trauma professionals don’t see any during their career. 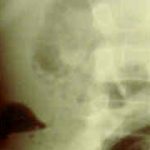 As with many pediatric injuries, there has been a move toward nonoperative management in selected cases, and duodenal injury is no exception. What we really need to know is, which child needs prompt operative treatment, and which ones can be treated without it? Children’s Hospital of Boston did a multicenter study of pediatric patients who underwent operation for their injury to try to tease out some answers about who needs surgery and what the consequences were. 90% had tenderness or marks of some sort on their abdomen (seatbelt sign, handlebar mark, other contusions). Free air was not universal. Plain abdominal xray showed free air in 36% of cases, while CT showed it only 50% of the time. Free fluid was seen on CT in 100% of cases. Contrast extravasation was uncommon, seen in 18% of patients. 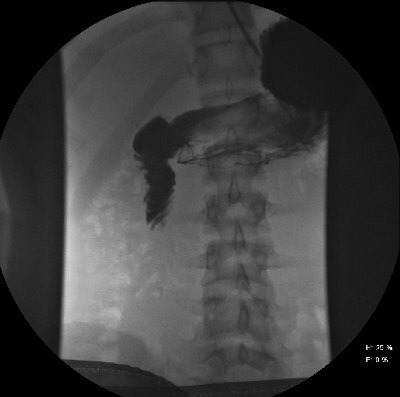 Although laparoscopic exploration was attempted in about 12% of patients, it was universally converted to an open procedure when the injury was confirmed. TPN was used commonly in the postop period. Postop ileus was very common, but serious complications were rare (wound infection <10%, abscess 3%, fistula 4%). There were 2 deaths: one child presented in extremis, the other deteriorated one day after delayed recognition of the injury. Bottom line: Be alert for this rare injury in children. Marks on the abdomen, particularly the epigastrium, should raise suspicion of a duodenal injury. 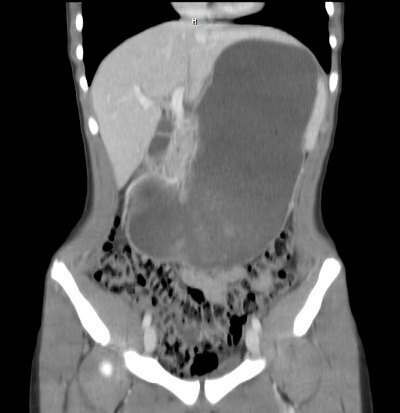 The best imaging technique is the abdominal CT scan. Contrast is generally not helpful and not tolerated well by children. Duodenal hematoma can be managed nonoperatively. But any evidence of perforation (free fluid, air bubbles in the retroperitoneum, duodenal wall thickening, elevated serum amylase) should send the child to the OR. And laparotomy, not laparoscopy, is the way to go. Reference: Operative blunt duodenal injury in children: a multi-institutional review. J Ped Surg 47(10):1833-1836, 2012. Put these three together and you get a patient engaged in significant physical activity who was struck in the abdomen. If no pads are involved in the sport, the patient has little padding of their own. This is a setup for pancreatic or duodenal trauma. This patient presented after being struck in the epigastrium by an elbow during a soccer game. It hurt, but wasn’t bad enough to stop playing. The following day, she was a little sore but felt bloated and started throwing up after breakfast. An (unnecessary) contrast study was performed, which confirmed the pathology. Note the tapering and corkscrew appearance of the duodenal folds. Final diagnosis: duodenal hematoma. This is a crushing injury from compression of the anterior abdominal wall against the spine. The third portion of the duodenum lies over the spine, as does the pancreas, so both are likely to be injured. 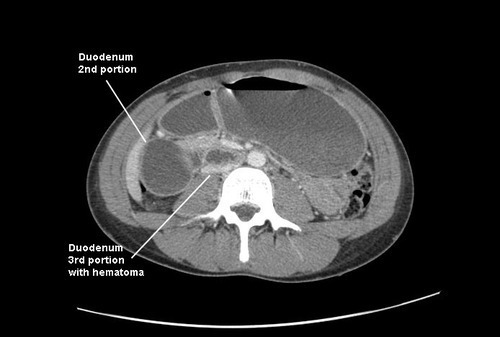 The latter organ appeared normal on the CT.
Management of blunt duodenal hematoma is simple: wait on it. These will generally resolve quickly over the course of a few days. NG decompression is mandatory, since nothing will pass the obstructed area (saliva, gastic juice, and pancreatic effluent, which add up to 2L+ of fluid per day). In rare cases, parenteral nutrition may be needed if resolution time is approaching the one week mark or in smaller children. A surgical approach with drainage of the hematoma has a low but significant morbidity compared to just waiting. Athletes may return to play soon after recovery. Mom brought him to the ED. The child appeared ill, and had a WBC count of 18,000. The abdomen was firm, with involuntary guarding throughout and a hint of peritonitis. 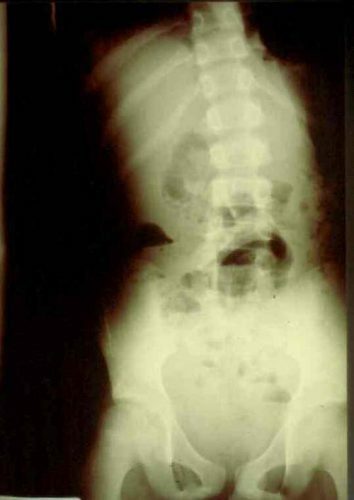 The diagnosis was made on the single abdominal xray shown yesterday. A closeup of the good stuff is above. To see the full-size abdominal xray, click here.